United States will soon export more oil and liquids than Saudi Arabia, thanks to the continued rise in oil production from US shale plays and the increased oil export capacity from the Gulf Coast. According to Rystad Energy, energy research and business intelligence company, it is a a pivotal geopolitical shift. The US has for decades relied on large-scale imports to satisfy its thirst for oil, but this is about to change. The Energy Information Administration (EIA) reported last week that the United States exported more crude and petroleum products than it imported. Granted, the EIA followed up with a report this week that US crude oil stocks had risen by 7.1 million barrels in a week, driven by a renewed appetite among US refineries for imported heavy crude oil. However, for the rest of the year, US exports will grow fast with increasingly attractive price spreads, while US demand for imported heavy oil should again diminish. “The oil market is overly preoccupied with short-term US crude stocks, but the big picture tells a new story. 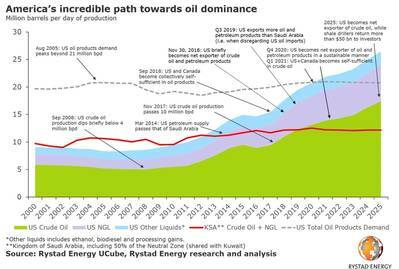 Increasingly profitable shale production and a robust global appetite for light oil and gasoline is poised to bring the US to a position of oil dominance in the next few years,” said Rystad Energy senior partner Per Magnus Nysveen." He added: “The political and economic impact of this shift in global trade has already been dramatic, and will be even more pivotal within the next five years. The US trade deficit will evaporate and its foreign debt will be paid quickly thanks to the swift rise of American oil and gas net exports. The tanker shipping industry will see the boom of the millennium, as the excess fossil fuels from America will find plenty of eager buyers in fast-growing Asia." Several important milestones are being reached these days. Since September 2018, Canada has been piping enough crude oil across the border to balance the US trade deficit in oil and petroleum products. US crude exports stood at 3.6 million barrels per day (bpd) one week ago, which neatly offsets the 3.5 million bpd of seaborne crude oil imports. At the same time, new pipelines are now bringing more oil to Texas and Louisiana’s expanding export hubs.